I can't decide if I want to give 'The Demon Lover' 3 or 4 stars. Let me first begin with - Isn't the cover lovely? I LOVE IT! It has a certain alluring quality, don't you think? I don't know how many of you have read/seen Stephen King's Rose Red but I love dark gothic stories,especially those that revolve around a haunted house that has a scary past to go with it. "It struck me suddenly as odd that although I'd written about supernatural creatures - vampires, fairies, incubi - I'd never once stopped to think they might be real. Or that the creature who had been making love to me every night was real. He was a fairy tale, just like the fairy tales my parents had read me at bedtime, a more sophisticated kind of 'bedtime' story." 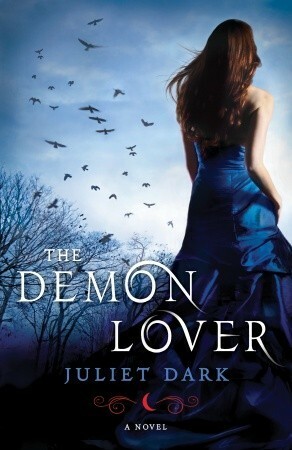 The Demon Lover is the story of Callie McFay, a well-known writer who takes up the position of Assistant Professor at Fairwick College in New York, which is pretty well known for its Folklore Department - a field in which Callie specialized. Only thing, she had no idea that by taking the job, she'd be moving into an eerie,haunted house in a strange town where everyone takes the myths seriously. As soon as I read the blurb and learned that it was about an incubus I really wanted to check this book out, mostly because it would be a refreshing change from my usual YA. It certainly didn't disappoint me. This is the first novel that I've read that's written by Juliet Dark/Carol Goodman and I found her writing pretty impressive! The story literally transported me into another world and Goodman's writing kept me completely engrossed. The frequent literature references, the parts about Dahlia Lamotte (I googled her, she's fictional. Got to hand it to the author for her creativity!) and the book's whole haunting vibe is what kept the story going for me! Juliet Dark, in a way, through The Dark Lover pays homage to some of the most popular paranormal authors till date. For me, I think, it was the writing that I loved rather than the plot. God I was highlighting so many quotes I liked from this book that I could fill this review up with just them. I'm trying really hard to not do that. The story starts off pretty good but I didn't like the direction it took after 40% into the book. I would've just loved for it to be just about a haunted house, scary past and an incubus. Too many paranormal creatures put me off. But back to the writing, I liked how even in the middle of a dark and twisty story, Juliet Dark/Carol Goodman managed to throw in some humor! "All I could see of the 'young woman from the city' was a toned bottom sticking out of the hatchback.Yoga bum, Annie would've said appreciatively." To end with, I did like The Dark Lover, maybe not all of it, but the book did manage to gain and hold my interest. It was a fascinating read and a refreshing change. Will I pick up the next book in the Fairwick Chronicles? I'm not sure. While I wouldn't go looking for it, if I come across it as by chance, I'll probably read it. I have this book in my TBR pile and I enjoyed reading your review on it. So many great quotes, huh. Can't wait.